Emma has finally discovered her hands and has figured out how they work. She has been playing hand in hand for a while, but over the last couple of days she has been picking things up, hitting things to make noise, and successfully putting her thumb (and everything else) in her mouth on the first try. Last night I was giving her a bottle and noticed that she was holding on to both sides. 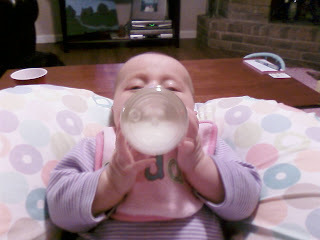 I decided to let go and she held the bottle for a couple of minutes. It has been a lot of fun the last couple of days watching her realize that she can interact with the things around her. I have been pulling out a lot of toys to keep her occupied and think it is fun when she recognizes some of her favorites and smiles. It is hard to believe that she will be 3 months old next week!! Emma has started using her thumb instead of her pacifier--we are glad that we do not have to take a pacifier away from her, we hope we will not have a big battle stopping the thumb sucking!!! Does it taste like bananas? The legs on this octopus make a crunchy sound. Emma REALLY likes that sound! Wiped out after a very active play time!!! I have gotten many compliments on my sling that I have been using with Emma and the cute name tags on Emma's diaper bag. 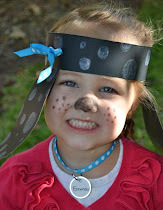 I thought I would give a shout out to the talented friends of mine who made these cute creations. The sling was made by my friend, Ashley. She and I work together at Northwest Elementary. Ashley and her sister make slings, bibs, nap mats, etc. They are very talented girls!!! Their website is http://www.sissysdesigns.etsy.com/. Ashley and I with our precious girls--Emma and Payton. Thanks girls for the cute baby things!!! I appreciate your creativity! 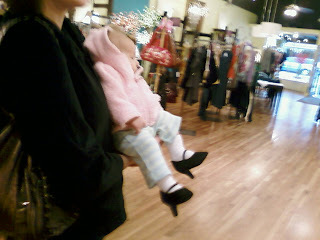 Emma trying on her first pair of high heels...Look out Trav---it has only just begun!!! Sunday was Trav's birthday--he turned 29. His brother and mom came in and took us out to lunch to celebrate. I have been getting Trav a cookie cake (requested by the birthday boy) every year that we have been together. He will eat the whole thing each year by himself because it is too sweet for me--probably not sweet enough for Trav :) I was happy that Trav had his birthday off (no reffing) and that we were able to spend the day together. Only one more year in the 20's--the big 3-0 is right around the corner!!! Today was a BEAUTIFUL day. It was hard to believe that it is mid January. Travis had the day off b/c of MLK and so Trav, Emma, Bodhi and I went to the park for a stroll. Bodhi enjoyed the walk more than Emma--she slept the most of time. Although I do not want Emma to grow up any faster than necessary, I am looking forward to taking her to the park to watch her play and explore the world around her. We got a new camera before Christmas and I have been going crazy taking pictures of Emma. I thought I would share a couple of cute shots that we have taken lately of our little pumpkin. She is constantly making my heart melt! Emma turned 2 months old on January 5th...she got her shots on the 6th :( We went to the doctor for her 2 month appointment and here are the stats--she weighs 12.8 lbs (75th %) and is 23 1/2 inches long (90th %). She got a shot in each thigh, poor girl didn't know what hit her. Her reaction was SOOOOO sad that it brought tears to my eyes. It made me upset to hear a hurt cry--much different from her normal, bothered cry. But things are fine and Dr. Millar is pleased with her progress. Emma is starting to smile at us ALL the time and is trying her hardest to start mimicking the funny noises that we are making. She has found out how to cough and thinks it is a fun way to get attention from us. She is also cooing and "talking" to us a lot. She has gotten a bit silly and smiley while breastfeeding--making it difficult for her to stay latched on and of course I smile and coo right back at her enforcing the bad habit :) She is eating well--clearly--and is sleeping just as well. The 5-6am wake up call is welcomed with open arms (literally). Emma usually wakes up with a smile on her face eager to greet the person who has come to rescue her from her rectangular prison each morning. I have loaded some before and after pictures showing her size. 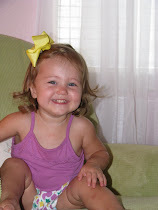 This girl has gotten big--it is hard to think of her as a fragile little bundle. Travis and I chose to stay at home and ring in the New Year with Emma. She enjoyed her bottle as we drank the champagne at midnight. My husband a firefighter? Who knew? Travis and I went outside to watch the firework displays that were happening in our neighborhood. There were 4 or 5 different houses around us putting on a pretty good show. We were standing in the backyard when we saw some flames flickering in the drainage ditch a couple of houses down. We thought for sure that somebody had a contained fire in a fire pit--maybe roasting some marshmallows?!?!?! Trav went around to the drainage ditch to see what was happening. Sure enough there had been some stray firecrackers that caught the dried leaves on fire in the ditch. When Trav saw what was happening he called 911 and let them know about the fire. He also decided to try to put it out while he was waiting for the fire department. It was a bit nerve racking for me to be standing on our patio chairs looking over the fence. I could see the fire growing above the fence line and saw my husband trying to stomp out the flames. The fire department did not have much to do when they arrived because of Trav's quick thinking :) When Trav walked back in the door he reeked of smoke. Our laundry room still smells like a campfire. Travis had just gotten these shoes a couple of days ago--they were glowing white. The flash makes the shoes look better then they did in person--they were pretty black. They have been washed twice with stain remover and they are still gray. Looks like Trav has a new pair of lawn mowin' shoes and will be looking for a new pair of tennies. Mia was trying to figure out how to pump her legs like the big girls next to her. At one point, she even looked at Camie and asked her to please go away--she is getting way more independent!!! This is how Emma sleeps 99% of the time. She looks like she is meditating. Bathtime Fun---Em's hair is starting to get long enough on top to start sticking up when we wash it. She has plenty of hair on the back of her head...we are now waiting for the top to start coming in. In the sunlight we have been seeing glimmers of red in her eyelashes and hair---do we have a little redhead on our hands? Wonderful Watchdog--Bodhi has been great since we brought Emma home. He has done a lot of sniffing and has inspected the little creature who makes a lot of noise. He just is soooo big, that when he goes in for a sniff it looks like he could eat her in one bite. Sooooo Sleepy.... Em has been doing a wonderful job at going to bed each night. I have been getting about 6 or 6.5 hours of uninterrupted sleep. I am loving it!! !